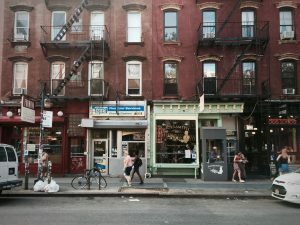 Cities are getting “smarter.” But are they getting wiser? 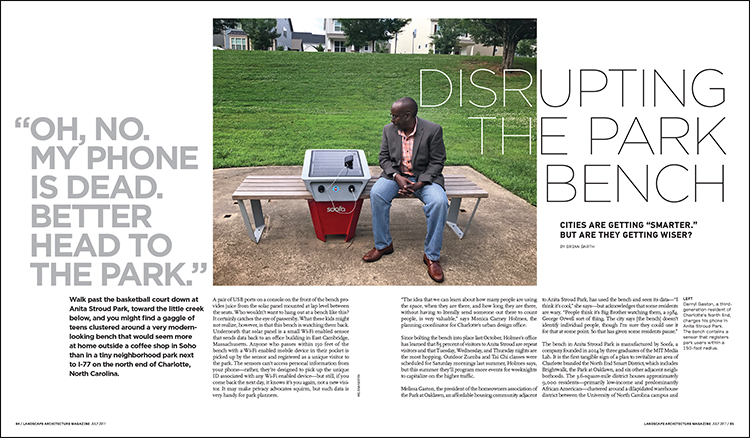 Featured in the July 2017 issue of Landscape Architecture Magazine. A pair of USB ports on a console on the front of the bench provides juice from the solar panel mounted at lap level between the seats. Who wouldn’t want to hang out at a bench like this? It certainly catches the eye of passersby. What these kids might not realize, however, is that this bench is watching them back. Underneath that solar panel is a small Wi-Fi enabled sensor that sends data back to an office building in East Cambridge, Massachusetts. Anyone who passes within 150 feet of the bench with a Wi-Fi enabled mobile device in their pocket is picked up by the sensor and registered as a unique visitor to the park. 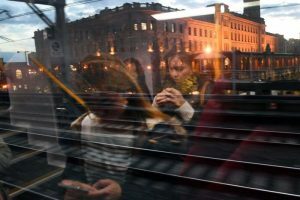 The sensors can’t access personal information from your phone—rather, they’re designed to pick up the unique ID associated with any Wi-Fi enabled device—but still, if you come back the next day, it knows it’s you again, not a new visitor. It may make privacy advocates squirm, but such data is very handy for park planners. Beyond benches, urban data collection is advancing rapidly. 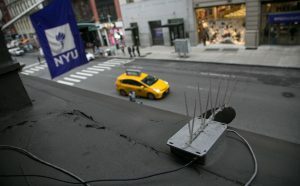 The Center for Urban Science + Progress (CUSP) at New York University, established in 2012 as one of the few research centers in the world with degree-granting programs in urban informatics, is home to the Sounds of New York City (SONYC) project, an initiative to map noise pollution—and ultimately to inform policies and design strategies to reduce it—through a network of sensors, augmented by information on noise conditions provided by citizens through an app. At the Urban Observatory, CUSP’s research facility in Brooklyn, specialized cameras and remote sensing equipment are mounted on top of the building to collect data on things like the heat island effect and sources of emissions that are invisible to the naked eye. A hyperspectral camera pointed toward the skyline around Prospect Park allows researchers to view the infrared light emitted by plants to analyze the health of tree plantings in different areas (plant stress is perceptible in the infrared spectrum long before it is visible to the human eye). This information is then cross-referenced with highly localized weather and air quality data to look for cause-and-effect relationships.